For some years we've preached that online advertising is a hoax. The web turned advertising upside down -- advertising is a both a means of expanding awareness of a product or service, and a means for publishers to generate revenue. Traditional advertising has been beneficial to both the advertiser and the publisher. Not so with web advertising. "Click" based advertising defrauds the publisher of 'pairs of eyes' revenue. A million viewers may 'see' and remember the advertisers ad, but if they don't click, the publisher gets nothing. Imagine if the SUPER BOWL used this model -- advertisers only pay the network IF and WHEN a viewer acts on the ad. Obviously the network would go broke. Imagine if the Wall Street Journal or New York Times used this model. Obviously there would be no newspapers. Shweiki Media has compiled facts and statistics from multiple studies and reports explaining why print advertising WORKS. From readership to engagement, commitment, expansion and more, Shweiki delves into the newest and most cutting-edge reasons why advertising in magazines is a can't-miss strategy for businesses, increasing exposure and - therefore - profits. Magazines open the mind a little bit more because the person is thinking and they get the ideas...Readers give commitment to their magazines. This means that readers engage with magazine advertising in a highly receptive and less distracted frame of mind. The number of magazine readers has grown more than 4% over the past five years. In fact, 93% of adults overall and 96% of adults under age 35 read magazines. Magazine audiences are growing at a fast rate, second to the internet across all groups. Reading a magazine is an intimate, involving experience, which is one reason the average reader spends 43 minutes reading each issue. An analysis of MRI data demonstrates that adults under 35-years-old read more issues per month than adults who are over 35. Did you know that adults 18 – 34 are more likely to be in the top quintile of magazine readership—the most avid or “heaviest” readers overall. Magazines open the mind a little bit more because the person is thinking and they get the ideas – and if the article is really interesting, they may ask themselves questions as they are reading it. The number of magazine websites and mobile apps is increasing, e-readers are projected to grow rapidly — and consumers want to see magazine content on them. Two separate sources show consumers' interest in reading across platforms. Among current subscribers, more than half chose to renew with a digital product. Among non-subscribers, nearly 40% chose an offer including print. 87% of those interested in reading magazines on a digital device still want a printed copy. The number of consumer magazine websites has increased nearly 50% since 2006, extending the reach and influence of magazines' editorial and advertising messages to an even wider audience. Also, a combination of magazines and the web is the best way to target mobile action-takers. Magazines are actively consumed by their readers, unlike TV, which is usually more passively consumed, and they are approached with an active and goal seeking mindset (a 'leaning forward' mindset). Readers give commitment to their magazines. This means that readers engage with magazine advertising in a highly receptive and less distracted frame of mind. More than 90% of all pages are opened by the typical reader, and the average page in a paid-for magazine is looked at 2.5 times by each reader. Two separate sources show that more than half of all readers (56%) act on magazine ads. And, action-taking has increased +10% in the last five years. Advertising recall — a measure of ad effectiveness for magazines — has grown 13 percent over the last five years. Actions-taken based on readers recalling specific ads is also strong, with an increase of 10 percent since 2005, according to Affinity's VISTA Print Effectiveness Rating Service. Two separate sources show that more than 50% of readers recall magazine ads and nearly 60% of those consumers act on the ads. Research shows that magazine advertising is most likely to be used as a buying guide than any other media. Magazine advertising is, therefore, most useful in generating purchase consideration. TV led in cost efficiency for brand awareness with magazines a close second. Magazines generated a superior cost-per-impact for brand familiarity with TV and online performing at almost double magazines' CPI. For purchase intent magazines yielded a far more efficient cost per impact than TV or online. Across categories studied, magazines outperformed TV and online when looking at the #1 ranking as well as the combined ranking for #1 and 2. Categories include auto, electronics, entertainment, and healthcare DTC. Magazines provide more “bang for the buck.” When looking at how each medium alone affected purchase intent, magazines increased purchase intent five times as much as TV or the internet. Magazines were the only medium to be ranked as most efficient at each stage of the purchase funnel, when media alone or in combination with other media were assessed. Based on a recent analysis of cross-media accountability studies, Marketing Evolution found magazines most consistently generate a favorable cost per impact throughout the purchase funnel. Multiple studies confirm that allocating more money to magazines in the media mix improves marketing and advertising ROI across a broad range of product categories. Magazines are the most consistent performer in the purchase funnel with particular strength in the key stages of brand favorability and purchase intent. Through all stages of the purchase funnel magazines performed most consistently with significant lift at each of the five stages. Among consumers with opportunity to see all three media, magazines were the only medium to contribute one-third or more to the total point change at every stage of the purchase funnel. Starcom found that when readers were asked to pull ten pages that best demonstrate the essence of their favorite magazines, three out of ten of the pages pulled were ads. Their findings reinforced the Northwestern University Magazine Reader Experience Study's results, in which advertising-related experiences increased magazine usage. 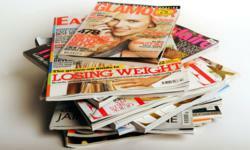 Consumers value print and magazine advertising, according to numerous studies. Yankelovich and Dynamic Logic both report that consumers are more likely to have a positive attitude toward advertising in magazines compared to other media. In addition, consumers are more likely to turn to magazines in search for information across a variety of categories compared to the internet, based on research from MediaVest. BIGresearch proves that magazines lead other media in influencing consumers to start a search for merchandise online, ranking at or near the top by gender as well as across all age groups. In addition, magazine ads boost web traffic, and magazine readers are more likely than non-readers to buy online. Magazines excel in driving web search across various demographics and perform best overall at influencing consumers to start a search for merchandise online —ahead of online media and word-of-mouth. What's more, magazines are the only medium to fall within the top three media across all age groups and both genders. Recent US research cited by MPA shows the best campaign results were achieved when using media synergistically and when including magazines in the mix. Magazines were the most consistent performers throughout the purchase funnel, producing positive results in the most campaigns. Factors that may have contributed to magazines' strong performance include: targeting, engagement, audience quality, and good creative. Shweiki Media's mission has always been to help publishers improve by providing the most profitable, hassle-free printing experience possible. This includes guaranteeing the highest quality product, exceptional customer service and on-time delivery.